Every time every year, the travelers come and go; you see them landing with their pale wings and flying back to the snow. You are currently browsing the archives for the 'Anne Litt/Weekend Becomes Eclectic/The A-Track' category. I go through withdrawal if I don’t listen to The A-Track (a.k.a. WBE) on the weekends. I know it’s been a while since I wrote something here that’s not about WordPress, so here are a few tidbits — some more random than others — covering the past few months. Nov(el) in Nov(ember). One thing or another has kept me from writing more often. I’ve been busy with projects; also I recently sustained a finger sprain, but it’s healing and I’m thankful that it’s not as painful now. If you’ve visited this site in the past few days, you may have noticed the image in the sidebar; I’m participating in National Novel Writing Month a.k.a. NaNoWriMo, where individual writers aim to draft a novel, written from the first of November until the end of the 30th. Although I’ve known about the “event” for a while, this is my first year as a participant. And although the official goal to “win” is 50,000 words, I’ll be happy if I reach 35,000. I’m looking at this as a good opportunity (i.e. excuse) to sit down and just write as much as I can, and then use it as a basis to extend and revise. I still think of it as WBE . For the first time in what seems like a very long time, I got to hear most of Weekend Becomes Eclectic The A Track live today (Anne Litt even played from Richard Buckner‘s new album again). A belated congrats to Anne Litt and Howard Franklin on the birth of their first child this summer. (I was going to mention it in the last post along with the “first WordPress baby” news, but decided to save it until now.) If you tuned in during in the summer, you know that Tricia Halloran filled in during Litt’s maternity leave. If you tuned in recently, you know that The A Track has been cut down from three to two hours (3 p.m. to 5 p.m. PT, still on Saturdays and Sundays), while New Ground and Cafe L.A. have been expanded to three hours (IIRC, Cafe L.A. used to be a three-hour show years ago). I wasn’t around to hear the on-air announcements of the slot change, so I’m not sure what (if any) reasons were given, but I’m going to guess it had something to do with her new duties as programming director for KCRWmusic.com (I searched for press releases but there are absolutely none listed now). In any case, I was very disappointed by the news of two fewer hours of her show on the weekends, but I’ll definitely take four hours as opposed to zero. Much success to Litt in her new endeavors. New and improved, sort of. As for KCRW’s new site, I can’t say I see a whole lot of front-end design improvements. I certainly prefer the new menus, which make it easier to navigate compared to the older site. Finding the right page was sometimes a little difficult and it wasn’t until I really familiarized myself with the (older) site that I figured out where to go for certain things. However, the new color scheme is a bit confusing at first, especially the inconsistent link colors (maybe it’s just my eyes, but the green footer link color on the purpley background is very unexpected after reading elsewhere on the site, and has a rather negative contrast effect that forces my eyes to look away). The site is still in the proverbial construction stage, but it’s a little frustrating to look for information such as the latest press releases and not find anything. Anyway, I’ve always had qualms about KCRW’s site, whatever the version, over the years. A long time ago, I participated in a survey to provide feedback and opinions about the site (the version that was just replaced) and I had a lot to say. Obviously, I still have a lot to say (for another example, why are the playlists no longer searchable? ), but since the new site is not quite “finished” yet, I’ll wait and see what happens. Not so spudly. Television-wise, I haven’t seen a lot of new shows, but I did catch the first three or four episodes of Studio 60 on the Sunset Strip . Perhaps my standards for Aaron Sorkin are just too high, but I wasn’t that impressed. His other shows were just so good right out of the gate (excluding the laugh track on early Sports Night ); this one seems to be weighed down by too much of a self-conscious, editorializing, in-joke atmosphere in dialogue and story, and so far, a lack of focus with all of the characters it has to handle. It may be a case of a slow start and bad marketing; the promos always bill the show as a sitcom by featuring one-liners and banter, and it is so not a comedy in the traditional TV sense (remind you of ABC’s trouble marketing the aforementioned Sports Night ?). Being that it’s Sorkin and Schlamme, though, and because I like Sarah Paulson‘s character, I will probably watch again to see if the show warms up and if the writers actually give Brad Whitford something to do besides stand around wearing reading glasses. As far as the rest of TV, there aren’t any shows that have really hooked me. I saw NBC’s other behind-the-scenes-of-a-comedy, 30 Rock (which really is a comedy show); it looked promising, but I haven’t made it a point to watch. I didn’t really get into the first couple of Heroes , I stopped watching Gilmore Girls sometime last season (or was it the one before that), there’s no more West Wing , I never really got into Lost or Veronica Mars after their first years, and I stopped watching Law & Order sometime after the last-last ADA change. I don’t really enjoy any of the other cop/procedural shows: none of the other Law & Order brands or any of the CSI incarnations (I used to watch CSI original, but that was a long time ago), and sometimes I’ve seen Without a Trace or Cold Case , but very rarely. Is there some show that I’m missing but shouldn’t be? Should I give Grey’s Anatomy another try? I’ve seen maybe two or three episodes of that, but didn’t get invested. And before someone suggests Battlestar Galactica : I don’t have cable. I watch cable shows once a lot of their seasons are out on DVD. Now, Voyager. Instead of current shows, I’ve been watching favorite series of years past: recently I watched/rewatched a bunch of old Star Trek: Voyager episodes. Voyager is the second of Star Trek’s stepchild series (i.e. not created by Gene Roddenberry); it was less sci-fi/Trek than the uniforms made you believe, and had its share of forgettable and/or recycled writing, lack of character development (Tuvok and Chakotay really got short shrift), and way too many time travel resets (count me as one of the many people disappointed by the direction of the final season and the series finale. Grrr, Berman and Braga). However, (surprisingly?) I still find myself rather fond of the show overall. I suppose it’s because I don’t think of it as Roddenberry Trek, but as a spin-off that happens to use Trek as a vehicle. My favorite character is the Doctor, who, of all the characters, had the best writing to support him over the course of the series. And I may be in the minority, but I think Seven, Naomi Wildman and Icheb brought an interesting sensibility to the show (although I could have done without “Collective,” and the writers featured Seven too often when they didn’t know how to write for the other characters). With that in mind, it won’t be a surprise to learn that I’m prone to enjoy Voyager ‘s better character-driven stories, whether they are thoughtful, fun, or amusing (or unintentionally amusing). Give me those over the Q episodes or the pointless Borg fights, any day. Well, this update should tide you over until the next one, which may be after NaNoWriMo is over. Until then, stay well. If you’re in the U.S., don’t forget to vote on Tuesday. I mailed in my ballot early, and I’m hoping for big changes from the midterms; on another note, I’m also looking forward to the cease of campaign calls. Don’t people know that calling about some candidate or measure during dinner hours doesn’t make a good impression? This is going to take some getting used to…Anne Litt‘s Weekend Becomes Eclectic music program on KCRW has a new title: The A Track . Apparently everything else will remain the same: same host, same eclectic music selections, same airtimes. I just heard the last hour of the show yesterday, and the reason for the new name has something to do with the program being (digitally?) distributed in a daily form, so the word “weekend” wouldn’t really make sense. I didn’t hear Saturday’s program, but the playlist for it still has the WBE title. I’ll have to listen to the streaming on-demand shows before they disappear later this week, and find out what exactly elicited the renaming. During the hour I listened, Litt played two consecutive tracks from the same artist — David Gray‘s “My Oh My” from White Ladder and “Alibi” from Life in Slow Motion . That’s rather unusual, even on her program, so I enjoyed the double-header. Looking at the rest of the playlist for yesterday, I was very surprised to see Jean-Yves Thibaudet‘s name. He’s one of my favorite current classical pianists — he’s not afraid to branch out, though (I was happy to hear him play and see his name in the credits of the recent film Pride & Prejudice ). I’m looking forward to hearing his “A track” later. Happy Christmas and happy Hanukkah. I’m enjoying Anne Litt‘s (live) Weekend Becomes Eclectic on this Christmas Eve — there are about 10 minutes to go. I haven’t been able to listen to the show in weeks, and so it’s a bonus treat that it’s live today. I tuned in at 3 o’clock and so far it’s been — as always — rewarding (btw, the playlist appears to be missing Debussy’s "Clair de lune"). Bob Marley – "High Tide or Low Tide"
Billie Holiday – "Strange Fruit"
Emmylou Harris – "One of these Days"
Simply put, that set has Litt’s name all over it…not because she’s ever played it before (that I know of), but because longtime WBE listeners will recognize her brand of taste. I’ve never heard that set but it was so familiar and welcome, yet unfamiliar and intriguing at the same time. I hope there is good music where you are. Richard Buckner is on tour again, so check him out at a U.S. city near you. Speaking of WBE , Anne Litt played from Laura Cantrell‘s new album a few times recently, much to my pleasant surprise — I don’t remember hearing Cantrell on the show before. I’m still waiting for the day I hear Allison Moorer on WBE . Speaking of Laura Cantrell, last week I tuned in to her performing live on KCRW (her debut on the west coast, apparently). She had a show at McCabe’s, which, I can imagine, was great. I first learned about Cantrell in early 2001, when I heard Bob Edwards interview her for NPR’s Morning Edition (hmm, it doesn’t appear to be available on npr.org), and bought her CD Not the Tremblin’ Kind pretty soon after that. She has a charming, honest voice that cuts right to the lyrics she sings, and she’s not a bad songwriter, either. Cantrell’s band for the KCRW broadcast last week included Mark Spencer, a multi-instrumentalist who’s well-known for backing up Jay Farrar. (You can read a previous post, where I provide links to free and legal Jay Farrar MP3s featuring Spencer’s great lap steel work.) And I just noticed on LauraCantrell.com that J. D. Foster produced her new album. Foster produced three of Richard Buckner’s (best) albums: Devotion + Doubt , Since , and The Hill . I haven’t forgotten about the posts I’ve mentioned writing, re: WordPress, and even that episode from Wait Wait…Don’t Tell Me! from a few weeks ago. They’re in the queue. Went to the L.A. Times Festival of Books on Sunday (the site’s already advertising for next year); made it to four panels. I’ll try and write more about that soon. I haven’t watched any television programs in a while…same goes for movies. I did switch the set on for a Dodgers game last month. That’s another thing that happened since I last wrote: baseball season is here. And the Dodgers run out ahead, 12-2 — their best start since 1955 — but in the next seven games, they’re 1-6. Welcome to the Show. I’m listening to Anne Litt and Weekend Becomes Eclectic as I write this. I haven’t been able to properly tune in to the show for a number of weeks now, for one reason or another. I’ve had to miss it or listen to a small portion for a while now — I did get to catch some of the repeat broadcasts, which air from 7 to 10 a.m. on KCRWmusic.com, KCRW’s all-music MP3 streaming music station. Last Saturday, I finally got to hear most of the show live and felt at home right away: there was no lack of the magical WBE quality (that keeps causing me to marvel over the selection of songs). Among the playlist then: Chet Baker, Keren Ann, Mogwai, Laura Cantrell (the first time I’ve heard her on the show), new material from Aimee Mann, Willie Nelson, and the Jayhawks (first time I’ve heard them on the show, I think). Last last weekend, I was able to listen for a bit, and heard Richard Buckner’s "A Chance Counsel" during the set! The last set that Litt just played (today): Spoon, Bob Marley, Keren Ann, Patti Smith, Dizzy Gillespie, Nancy Sinatra, and Anne McCue. Excellent. John Wesley Harding – I first heard JWH on a compilation CD from Acoustic Guitar Magazine , performing "Kiss Me, Miss Liberty" and I’ve always meant to listen to more. His official site houses some full MP3s: check out the "Live MP3s & Rare Singles" sub-section under "Music." Ivy – Long Distance (2001). This album is a few years old, but I’m surprised not many people seem to know about it. Or maybe they do? In any case, I first heard Ivy three years ago, when Anne Litt played "Edge of the Ocean" a few times on Weekend Becomes Eclectic (KCRW). It’s catchy music with a lush arrangement and a cool beat; the same can be said for many of the tunes on the album. You might also be interested in the band’s cover of "Sing." Anne McCue – Roll (2004). Admittedly, I have not heard the full album from this Australian singer/songwriter/guitarist. Anne Litt plays tracks from Roll fairly often on her show, and although I haven’t really gotten hooked to the very ’80s-sounding "I Want You Back," but I’ve been playing "Stupid" and "Crazy Beautiful Child" repeatedly over the past few weeks. If I had to choose, I’d categorize the songs as being more pop/rock with a country flavor, rather than alt-country, but that’s primarily because of the arrangements and the overall sound. Think of a less twangy Lucinda Williams, but still catchy and with interesting lyrics. Patrick Park – I’ve mentioned singer/songwriter Park a few times — his site has MP3s of various clips of songs, but only recently put up a couple of full-length MP3s: the original demos (that eventually got packaged into The Basement Tapes ) of "Desperation Eyes" and "Nothing’s Wrong." "Nothing’s Wrong" is one of my favorite Park tunes, and although I can listen to the fuller arrangement (and Eric Heywood on pedal steel!) on the album Loneliness Knows My Name , it’s nice to have this sparer, more intimate sounding recording. Elliott Smith – I mentioned last time that PasteMusic has many free MP3s from artists, including Smith. One of my favorite Elliott Smith songs is here: "Between the Bars," from Either/Or . If you have time, you might want to grab all four of the songs (all from Either/Or or Elliott Smith ) and hear the beautiful and haunting qualities in the stark, no-nonsense arrangements of his music: "Speed Trials," "The Biggest Lie," "Punch and Judy" and "Needle in the Hay." And as always, please support the artists and their music by buying their albums and attending their shows (if possible). The latest "caught in my head" tune has to be "How on Earth" by Ron Sexsmith — excellent songwriting. I haven’t heard the entire record yet, but from what I’ve heard, I think I like it better than Cobblestone Runway (2002) — not just musically speaking, but his singing even sounds stronger than I’ve heard before. And, of course, I’m still listening to Richard Buckner (this time, the more sparse arrangements, e.g. those in Richard Buckner ). His new album, Dents and Shells , will be available for pre-order on the 1st of October! From the new songs I’ve heard in his more recent concerts, I can’t wait. It’ll be interesting, as always, to hear how he arranged the music on the record. Weekend Becomes Eclectic is undoubtedly pre-taped this weekend. It’s the same deal today as yesterday. 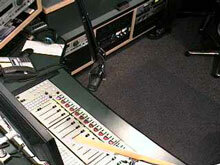 Witness the KCRW webcam: I saved this shot this afternoon while I was listening to Anne Litt speaking on air (about 2:22 p.m.). There’s no one at the mic, no CDs piled around, and if you look at the board, only the last fader is up…and it hasn’t changed position (as far as I can tell) since the show began. It is interesting, though, that both shows are pre-taped and that no other hosts filled in live. I wonder what the policy is on substitute hosts. Of course, no offense to the other hosts, but when I tune in to WBE I do it because of Litt’s playlist, so I actually prefer pre-taped WBE shows when she’s away. I think I’ve only heard her pre-taped one other weekend, but I can’t be certain. I can’t be certain, but it seems as though today’s edition of Weekend Becomes Eclectic (KCRW) was pre-recorded. To be honest, I probably wouldn’t have been able to tell, except I checked the main studio cam, and Anne Litt isn’t spinning the discs — in fact, no one was sitting in the chair for the beginning of the show, anyway. I did notice very minimal talking from her between song sets, but that doesn’t necessarily mean that she’s pre-taped her show. Either way, it’s good to hear her music selections again, since for the first time this calendar year, I missed listening to any part of her show one day (last Sunday). Update, 15:47: I should have said, Either way, it’s great to hear WBE again. She’s playing Richard Buckner‘s "Lil Wallet Picture" from Devotion + Doubt ! It might be the first time she’s played Buckner in 2004. It’s certainly the first time I’ve heard her play this particular track. I was just listening, and I heard the unmistakable sounds of that pedal steel guitar (I think by Lloyd Maines?) over Buckner’s steel-string guitar. It’s always good to hear Buckner getting airplay. Just a number of random and not-so-random thoughts. I can’t believe we’re already in an election year. The presidential candidates seem to be cancelling each other out. Who’s it going to be? It’s still early to tell, despite what polls say. Please, please, vote this year. If you think your vote doesn’t make a difference, let me say two words: Florida, 2000. Music still helps keep me sane. I think taping Anne Litt‘s show is one of the smartest things I’ve ever done. These days she’s pretty good about playing Alison Krauss (and she played the Sting song from Cold Mountain …and I still think that "The Scarlet Tide" is a better song), and Norah Jones‘ new song "Sunrise" as well as Clem Snide. A few weeks ago, I watched Howards End for the first time in at least four years, and was amazed by how much it still moves me, and how beautiful and lonely and powerful it is. It must have been my ninth or tenth time watching the movie, but I still noticed new things. They really don’t make movies like it anymore, and it was made in 1991. I picked up E. M. Forster‘s novel and read bits and pieces. I have a terrible memory when it comes to books, ironically, and so even if I’ve read and studied a book intensely, a year or two later I will have forgotten much of it. So I will re-read, and I will remember some things, but I will rediscover, as "new" many more things. Howards End is an excellent book, and still my favorite. It’s interesting that something I loved as a teenager, I still love so strongly — I guess some things don’t change. Just a note that Anne Litt will be sitting in for Nic Harcourt on Morning Becomes Eclectic tomorrow and the day after tomorrow (i.e. Monday, 22 Dec. and Tuesday, 23 Dec.)! I don’t know if the shows will be archived, but this is a great chance to catch more of Litt’s playlists, especially if you’re not a regular Weekend Becomes Eclectic listener but do tune in to Harcourt. MBE airs 9 a.m. to noon, Pacific time. Check publicradiofan’s listing for the show for more details. Nat King Cole, "These Foolish Things"
Tom Jones, "It’s Not Unusual"
…and a good mix of bluegrass, rock and even some Yiddish music! Also some songs I’d love to hear again (but I missed their IDs, so I’ll have to wait until she does play them again or I look for them on the show’s official playlist). And this is just one day! I hope I’ll be here to listen tomorrow. BTW, KCRW has amazing music hosts, don’t get me wrong. Nic Harcourt, Gary Calamar and Chris Douridas are great, as are Liza Richardson and Tom Schnabel and the list just goes on…but Litt plays a very eclectic selection, from varied time periods, not just styles, and they match my own musical foundation, and I would hope quite a few other people’s. I really don’t understand why her show is not archived at KCRW’s site.